A spring day in May turns an old man's fancy to ... well that' a fantasy! 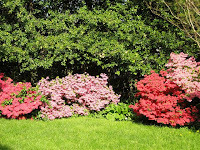 But it was a glorious day yesterday - the azaleas in full bloom in the back yard while artisinal cheeses and craft beers were in abundance in the back room of the Arlington Whole Foods Market. 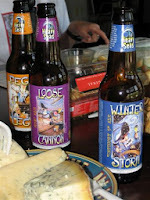 The Washington Wine and Cheese Society has asked me to co-host a Beer and Cheese Dinner for their June 26th meeting. Yesterday was the planning session. 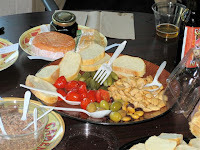 Fellow co-host Michael Kiss - the cheese monger at the Whole Foods Market - spread out a board of 15 different cheeses and various snacks for Society members Tony Guida and Barbara Holtcamp Williams, and Michael and me, to sample. I supplied the Clipper City beers. 15 cheeses: it was not for the lactose-intolerant or the waistline-worried! We winnowed that board down to 5 cheeses and 10 beers. I won't spoil the fun; you'll have to attend the event to taste our decisions. There are a few clues in the pictures, however. When not tasting beers and cheeses, Tony performs as the nefarious Sinnius Vice at the Maryland Renaissance Fair and is an investor in a downtown D.C. gourmet hot dog cafe. Barbara organizes bicycle tours of local wineries; she has been known to visit breweries as well. We plan five flights of two beers and one cheese each, matching beers of different styles with cheeses selected specifically to complement the beers, and accompanied by some spectacular smoked bluefish and crusty bread. 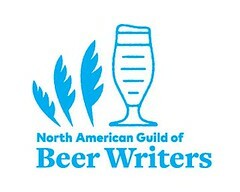 The beers will be selected by Tom Cizauskas of Clipper City brewing Company, and the cheeses will be selected by Michael Kiss, of Whole Foods Market, Arlington. Both will discuss the finer points of pairing beer and cheese. 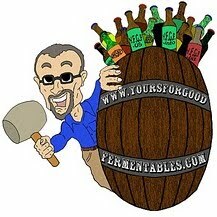 The final beer will be drawn fresh from a cask! We can only accommodate the first 108 tasters, and there are no reservations, so plan to get there early to ensure a seat. The price for this spectacular evening is only $20.